My exposure to rubber stamps started in 1999 with simple scrap booking and a family recipe book. By 2001, I was hooked after visiting local stamp stores but found they did not have the type of images that I wanted. 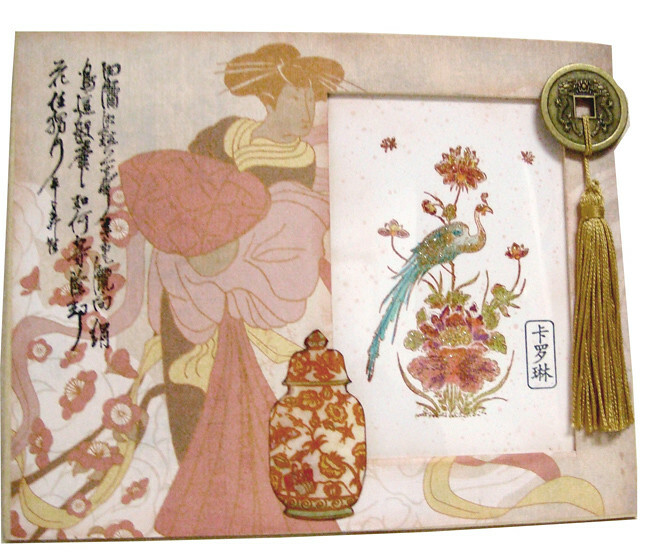 I did a search for oriental stamps and found Ann at Stonehouse where I purchased my first plate. One of the stamps is the focal point on my main project; and after using it for over ten years, it still stamps perfectly. I love to experiment with techniques and have no favorite because there are so many that appeal to me. At an early age, my mother taught me that it was better to broaden my likes and dislikes and not conform to other’s standards whether it is clothes or current trends. It is okay to be different. When I take a class I prefer to take the technique and change it to my liking. I don’t want someone to say that my art is identical to the person sitting next to me. You might ask how that is possible if you use the same image. There is always a way to change the background, color, emboss or placement. Again, how can you have a favorite when there are so many companies that have produced excellent stamps. However, I still favor Stonehouse and the beautiful stamps from About Art Accents. I also have a huge supply of stamps from companies no longer in business. 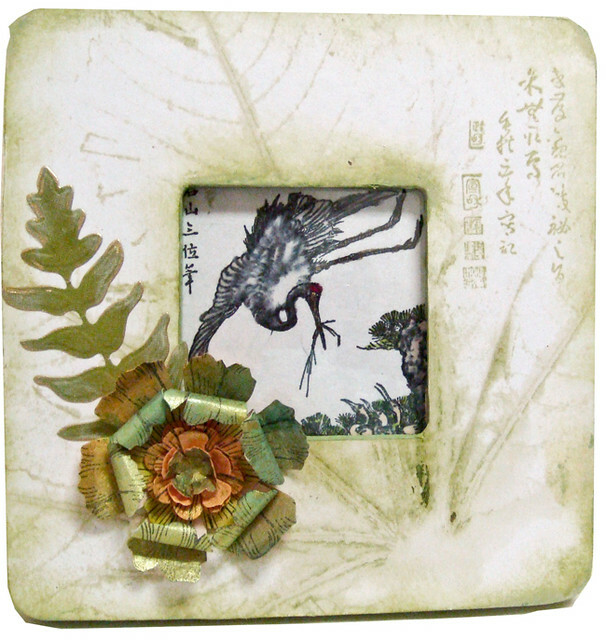 Floral images always catch my eye because they are so elegant in the true Japanese style. I also love geisha images and scenic ones too. FLOWERS, I LOVE FLOWERS. Without my heat gun, cutting and scoring tools I would be lost. To enhance what I create, a gold leaf Krylon pen is an absolute must have. The standard red, black and gold are always stunning and the soft pastels for floral images are favorites. Adding embellishments is always fun and adds so much. I like to use ribbon, charms, beads, brads and other items that fit the theme. My heat gun would present a great loss. I keep an extra on hand in the event one quits in the middle of a project. I don’t think my tip to the group has ever changed. Jump in and join swaps; experiment and don’t be afraid to do something different because you might be surprised with the outcome. Holding a piece of art that another member has created is the best learning experience because it is inspirational and gets the creative juices flowing. The oriental theme in art is gracious, flowing, beautiful, elegant and has a mystique that I love. I always wanted to travel to Japan but at this stage of my life I’m happy to visit local stores, art club, friends’ homes where we exchange stamps and have the best time sharing our talents. This list is long but a few take up more of my time than others. I belong to two local stamp clubs that meet once a month. I participate in several Yahoo groups and a couple of blogs with weekly challenges that involve stamping. I’m also very active in digital art groups. I don’t like to name specific magazines because at one time or another one of them held the top spot from my viewpoint. Times change, likes change and magazines also make changes to meet customer preferences. Gardening is an ongoing hobby because of my love for flowers. I also belong to a local book club and find time to read that was on the back burner during my working career. Digital art is my new passion and the options are endless. My inspiration comes from friends, members of art groups and the desire to try something out of the norm. No art background. You’ve heard the statement, “I color because I can’t draw.” It must have been written just for me. Beeswax, fabric, clay are fun to use with rubber stamps. Again, favorite websites are like the magazines. They come and go and I truly can’t place them in a favorite order. Blogs contain a vast amount of techniques and ideas and when I hear of a new one, I check it out. If you want inspiration, look outside and Mother Nature will fill you with ideas. Don’t be afraid to do a search on the web for a technique or company you hear mentioned. I find a lot of my ideas using this method. Yes, I am the cook, bottle washer, shopper and assigned driver in our household. We are both retired and hubby has severe back problems so we work together to make life enjoyable for both of us. We retired to Idaho from southern California in the fall of 1996 and have never regretted the move. The only negative is our three adult children and grandchild live in California. We look forward to visits and actually get to spend more one-on-one time when they come to Idaho. We have one household member, Peaches, a golden retriever. She watches over both of us and panics if she can’t locate one or the other. She provides lots of laughs and entertainment so life is not dull. We are also very fortunate to have wonderful friends and neighbors who make life so pleasant. LASTLY, I must say that the friends I have met through art clubs, groups, blogs and through the internet are very dear to me. They inspire me, support me and their input is what pushes me to try new things. I have internet friends that I am very close to even though we have never met in person. THANK YOU FOR INVITING ME TO BE YOUR SAM FOR JULY 2011. 1) Select a frame of your choice. I elected to use a wood frame approximately 8-1/4 inches square with a 3-1/4 square cutout in the center for a photo. If you use wood, sand any rough edges and wipe with a dry cloth to remove any residue. 2) Select papers to cover your frame matching a color in the paper with acrylic paint for the sides. 4) Paint the frame and when dry, apply the decorative paper by placing the frame face down on the paper, trace around the edge and center cutout. Trim and attach to the frame with Mod Podge Matte or adhesive of choice. Because the paper was rather heavy I applied Mod Podge to both the frame and the paper using a foam brush. 6) Embellish the image with Stickles glitter glue and when dry insert into the center of your prepared frame. The next step is to cover the back of the frame with paper or fabric because once you finalize your embellishment you won’t want to place your frame face down to cover the back. 7) Before I added the final embellishments, I sponged the outer edges of the decorative paper with caramel ink and then used gold German decorative paper scrap and attached it to the edges of the frame as shown using Mod Podge. 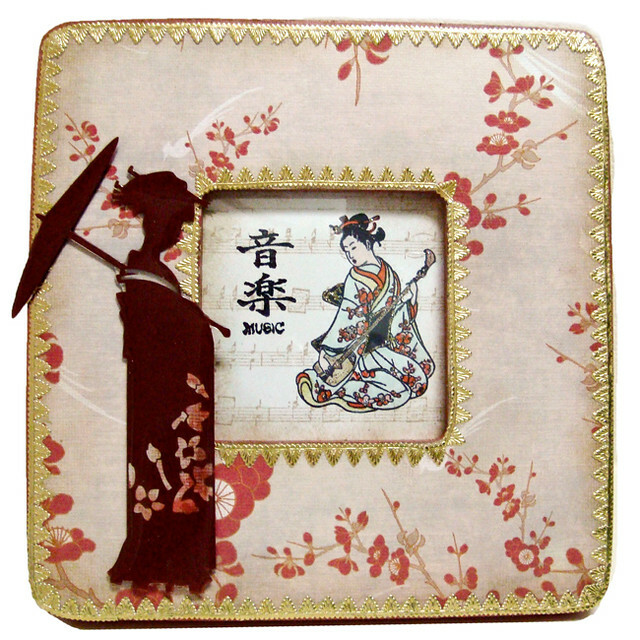 8) I had a red die cut of a geisha which was perfect for the final touch. I covered the die cut with Ice Resin available from http://www.objectsandElements.com Ice Resin gives the appearance of glass and dries clear and hard. (When using Ice Resin, poor it in the center of the object and spread outward using a toothpick or wood stick to cover the entire area. Cover the piece with a glass dish to avoid dust or other unwanted bits from sticking to the surface. WAIT OVER NIGHT TO REMOVE COVER.) I used thin foam tape to attach the die cut to the frame. 9) In lieu of a die cut, you could add a colorful butterfly, stamped and colored image, collage image or flower and apply Ice Resin. They work beautifully. I hope you will try to alter a frame. They are very fun to create and the choices are endless. 11 Responses to July 2011: Carolyn S.
Congratulation for being Juli’s 2011 famous stamper for a month Carolyn. Like both of your projects and the die-cut idea is one to remember. Congratulations Carolyn. So richly deserved. Beautiful, Carolyn – and I really enjoyed reading your bio. Congratulations! It’s a very well deserved honor for you. Yeah Carolyn, I love the projects, gorgeous. gorgeous. Congratulations Carolyn. . .great profile and projects!! Enjoy your month in the spotlight. . .
Congratulations Carolyn on being named July SAM. Loved your profile and your art has always been above and beyond! Lovely frames. I definitely want to try this. Thanks for great ideas and congrats on being selected SAM for July! Congratulations Carolyn! Wonderful projects and great inspiration. Enjoy your month as SAM. Hi Carolyn fantastic bio and great projects. Loved your description of life with Peaches, dogs are such a joy. THANK YOU ALL for your very kind remarks about my project. I started out to do one and and just kept on going. Frames can be addictive and I do hope you will try one yourselves. Congratulations Carolyn…Thank you for sharing your bio…it’s great to get to know you! Your art is so inspiring, and innovative! Enjoy your well deserved month as SAM!